Are you ready for springtime? I'm so looking forward to its start since is truly my favorite time of the year when the days are longer, the birds fly back, the flower bloom and the air is fresher...enough reasons, right? :) Spring is indeed the season of rebirth, renewal and hope to me. And, most of all, is the perfect time to add more colors in your home, in your outfits, in your makeup and in your hair. 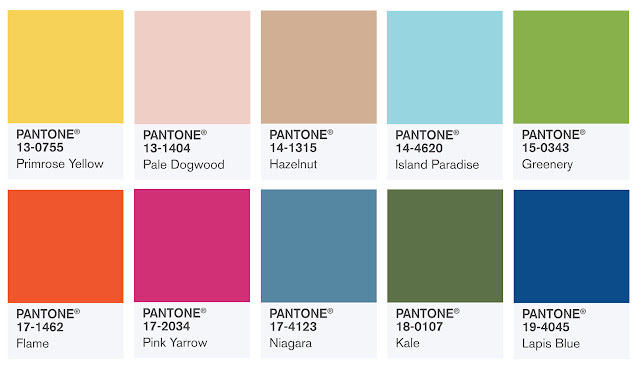 According to Pantone, the top shades for Spring 2017 are: Niagara, Primrose Yellow, Lapis Blue, Flame, Island Paradise (those are the leading five colors), Pale Dogwood, Greenery (color of the year), Pink Yarrow, Kale and Hazelnut. Niagara is going to be the most prevalent color and is definitely my favorite, together with Greenery, Flame, Primrose Yellow and Pale Dogwood. Which ones are yours? Are you happy with these picks? Let me know in the comments below and have a nice week! Naturalmente non posso che apprezzare che ci siano il rosa e il fucsia, molto belli anche il blu e l'arancione! :) Buon lunedì Lilli!!! Quanto mi piacciono questi colori... tutti!!! Hi Lilli, I can't wait for Spring. Probably two months for us. But the weather this week in Toronto has been mild. I like the colours especially the blues, Niagara, Lapis Blue and Island paradise with a touch of the pink. I'm so ready for Spring as well Lilli! The winter weather is just becoming a drag now and spring is also my favorite season. I've already been wearing more color in anticipation :) Happy new week to you! Molto belli, il rosa e fucsia li adoro! Dear Lilli, i saw your foto today at Instagram. Spring i already coming in Italy. Here in germany everything is still gray. But since a week i heard the bird singing early in the morning. Sping is my favorite season too. A me questi colori primaverili piacciono molto. Soprattutto i toni del rosa. Loving the first row! Thanks for sharing sweetie! I like these colours; they will make interesting combinations and will create poppy looks! I like several shades of this range my favorites are the first ones and the last ones, I'm anxious to see your proposals in these colors. Happy start of week hun! Hi Lilli. Thanks for sharing these color tips. I love these vibrant colors !